Special promotion for Mon Cheri Cruise from 1 April to 30 Sep 2019: enjoy free limousine bus round trip (value $40/person) AND free 45 min foot/ back massage at a local spa in Hanoi. Book Now! Get free shuttle bus for trip from now until Feb 28th and save $40/person on transfer cost. Book Now! Book special spring promotion on Swan Cruise with us, price from only $149/person including transfer round trip (rate based on double/ twin share cabin). Valid for trip date from now to April 2019. Enjoy free transfer from Hanoi when you book Glory Legend Cruise on our website. Promotion is valid for all bookings made from now until December 2019. Book now and save up to $30! Special promotion for our Azalea Cruise package: get free 60 minute foot/body massage at a reputable spa in Hanoi. 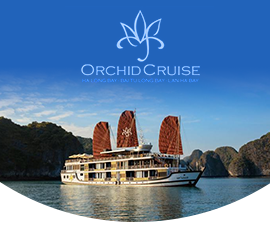 Special promotion for Orchid Cruise: Book a cruise with travel date from 1 Jul till 30 Sept 2019 and get free 60 minute foot/body massage at a reputable spa in Hanoi. Special spring 2019 deal: enjoy free shuttle bus and save up to $60/cabin. Promotion applies to new booking only. Enjoy free limousine bus when you book Mon Cheri Cruise from 5 Jan to 28 Feb 2019. Save $80 per booking! Special promotion for Peony Cruise: Book a cruise with travel date from 1 April to 30 Sep 2019 and get free 60 minute foot/body massage at a reputable spa in Hanoi. Save $18/person on limousine shuttle bus fee if you book 3 day 2 night trip on Azalea Cruise with us. Offer is valid for new booking only.